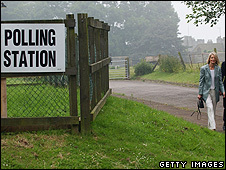 BBC News - Does the weather influence elections? Does the weather influence elections? The weather forecast for Thursday is cool and cloudy. So could that affect the outcome of the election? If the theory that sunshine entices Labour voters to the polling booth is true, then the weather bulletins for Thursday will please David Cameron and Nick Clegg more than Gordon Brown. A lot of cloud, a chilly breeze and some showers is the forecast from BBC Weather, as of Tuesday lunchtime, although there may be some sunshine later in the day in eastern parts of England. The long-held theory is that Labour voters are more likely to be deterred by bad weather. Political commentator Anthony Howard says this is borne out by opinion polls which show Tory voters are more certain to go out and vote. So sunshine means a higher turnout and more Labour votes. When people cast their minds back to the Labour landslide of 1997, they remember a warm spring day. Turnout was high that day, at 71%. So how much does the weather really influence voting? Not much, says Stephen Fisher, a politics lecturer at Oxford University who has studied the relationship between the weather and turnout. "If you made a statistical correlation and scored the weather according to how good it was and compiled a graph showing voter turnout, over the last 15 elections you don't see a correlation." There are good reasons to believe there would be a link, he says, because it is less pleasant to go outside in the rain, but there is little evidence that it is true. "In 2001 turnout was 59% and in 2005, 61%. The turnouts were much lower than other post-war elections, which average at 70%, but the weather was pretty good on both those election days. "Even if you thought it was unseasonally cool in June 2001, it was better weather than [the election in] February 1974, or other elections held in the autumn." Also, about 15% of votes are now cast by post so even if the theory worked in the past then it would seem to be less relevant now, says Dr Fisher, because a significant chunk of people are not going out on the day. Some parts of the UK have experienced rain on election day and it has made no difference to turnout, says John Curtice, a professor of politics in Strathclyde. "We are talking about elections in spring or autumn. If you had a January snowstorm it would make a difference but for the most part the weather is mildly inclement at these times of year. So you might need to take a brolly with you or you might have sunshine but you won't have a howling gale or snow or serious travel disruption." A low turnout is always a Labour fear, says Howard, and opinion polls still back this up. "The prospective Conservative voters are more certain to vote than Labour supporters, so a low turnout does significantly favour the Conservatives, although low turnouts in 2001 and 2005 didn't stop Labour winning." Rain in the evening is always thought to be disadvantageous to Labour, says Mr Howard, because the conventional wisdom is that their voters tend to go to the polls between teatime and 10pm, he says. "There is probably something in it, because in the older industrial working-class areas, people voted on their way home from work and the middle class tended to go out in the morning or lunchtime. "So rain in the evening has always been a frightening prospect for Labour. It's probably less relevant these days but I think there is still a grain of truth in it." Conversely the retired vote is made up of people who tend to vote Conservative, says Howard, and they go out in the morning. But Howard says he cannot recall any terrible weather on polling day, and there were other external factors that could influence voting, such as what's on television. "In 1964, Harold Wilson went to enormous lengths to get [BBC director general] Hugh Green to move Steptoe and Son because that was going out at 9pm and he thought, probably wisely, that it would be devastating for Labour." Elections that are too close to call can also galvanise voters into getting to polling booths, he says. "I don't know what will happen but I certainly hope that the TV debates and the closeness of this election will mean the turnout is much higher than 2001 and 2005."